“I’m talkin’ about friendship. I’m talkin’ about character. I’m talkin’ about–Hell, Leo, I ain’t embarrassed to use the word. 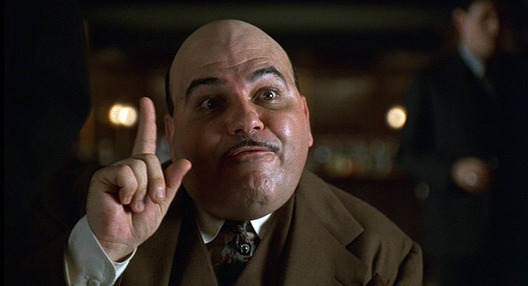 I’m talkin’ about ethics.” — Johnny Caspar (played by Jon Polito). 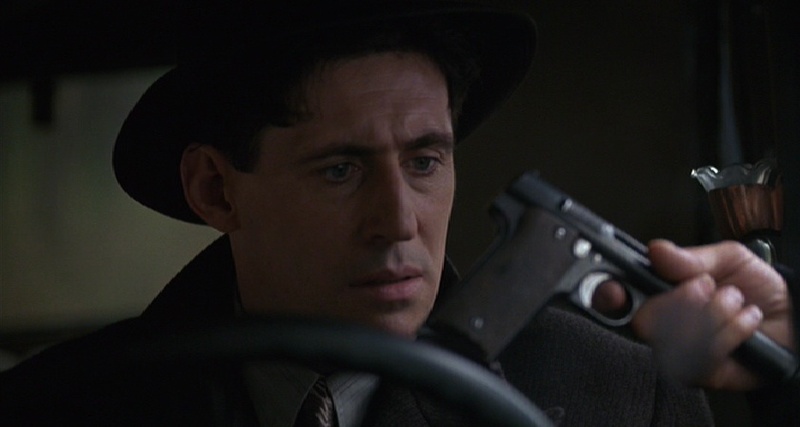 “Where’s me hat?” — Tom Reagan (played by Gabriel Byrne). 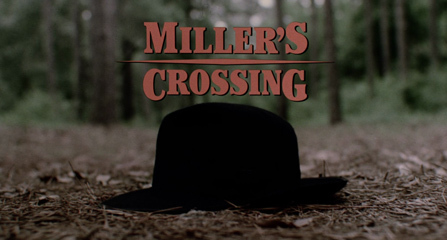 Like a single domino tipping over, the opening sequence of the Coen Brothers’ gangster epic Miller’s Crossing sets off a chain reaction. Everything that occurs in this film, every double and triple cross, every murder, every crime; they can be traced back to this scene. This scene also introduces the main theme of the film, along with its most distinctive symbol. 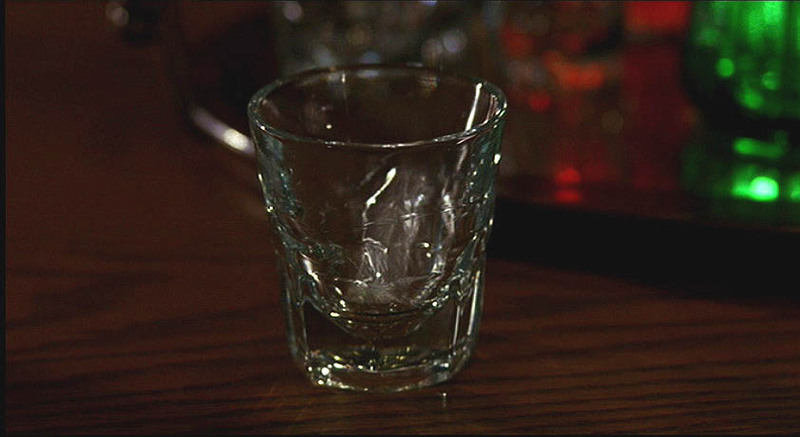 The film opens with a close-up of a shot glass, we watch as the ice cubes plunk down into the glass and the shot is filled with, of course, Irish whiskey. We cut to a sweaty, volatile gangster named Johnny Caspar, played with a volcanic intensity by Jon Polito. It is Caspar who gives the aforementioned speech on ethics, a subject he seems to be obsessed with. 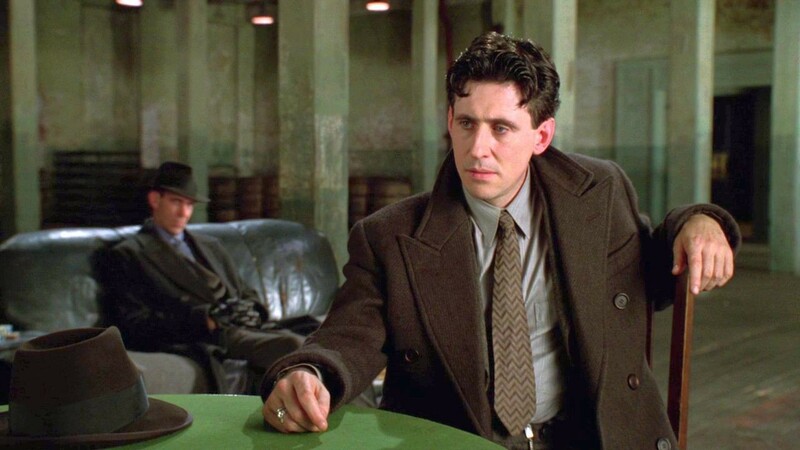 Caspar has come to Leo (a brilliant Albert Finney, in a role originally written for the late Trey Wilson), the tough, old-school Irish mobster who, for lack of a better word, runs this unnamed town. They are both flanked by their right-hand men. The Dane, Caspar’s main henchman, looms over the diminutive Italian kingpin; he is played by J.E. Freeman in a performance of glowering evil and menace. 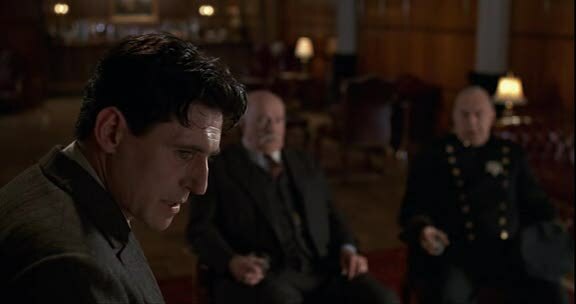 Leo’s second-in-command, however, Tom Reagan (Gabriel Byrne), is standing far in the background, watching in silence and calculating every move. Tom Reagan is the one who sets the labyrinthine plot in motion, and part of the fun of the film is our uncertainty to what Tom’s end game is. 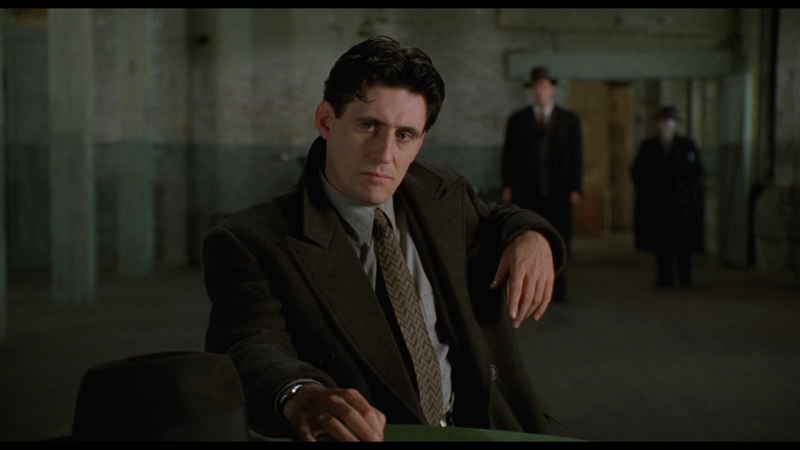 Caspar has come to get Leo’s blessing to kill one of Leo’s underlings, a sniveling, crafty weasel named Bernie Bernbaum (Coen mainstay John Turturro). Leo, who is romantically involved with Bernie’s sister Verna (Marcia Gay Harden, in her second film role), refuses to give over Bernie. Bernie has cheated Caspar out of money made from fixed fights, and Caspar demands blood. Again, the issue of ethics comes up, as Caspar accuses Bernbaum of being “ethically kinda shaky” (one of the countless pleasures of this film is the way Polito says the name “Bernie Bernbuam”). Leo’s ice-cold refusal of Caspar’s request (“take your flunky and dangle”) causes Caspar to erupt in a truly impressive display of rage, only to have the hulking, demonic Dane put a hand on his shoulder to calm him down. It is only after Caspar and The Dane leave, and the fierce energy in the room has settled, that Tom speaks. 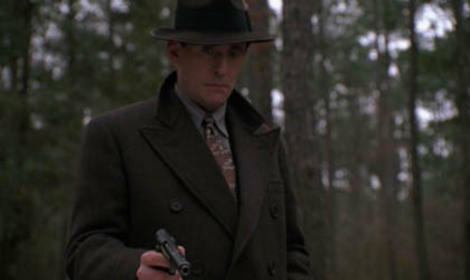 “Bad play,” is what he says to Leo, and indeed, Tom does see the criminal world as a game of skill and strategy. “Bad play” is also an appropriate comment because just about every character in this film plays sides, and quite a few will switch their allegiances. 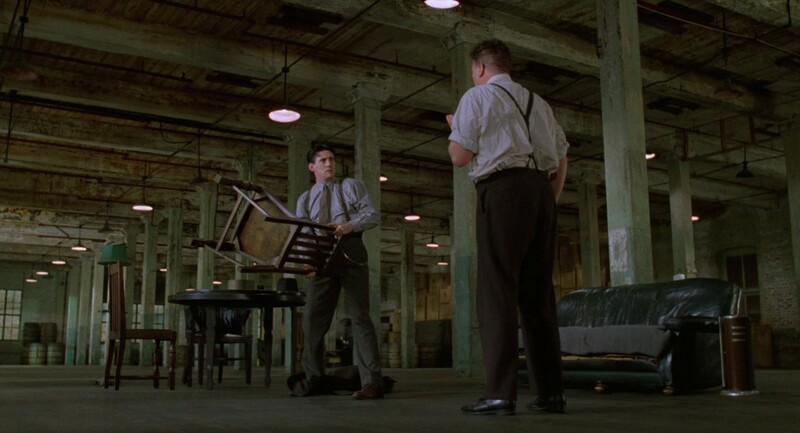 The relationship dynamic between Tom and Leo, like a gangster father and son, is one of the driving forces of the narrative. Their relationship is challenged by Leo’s handling of the Bernie Bernbaum situation, and it is further complicated by the fact that Verna is playing around with Tom on the side. “Think about what protecting Bernie gets us, think about what offending Caspar loses us,” Tom warns, perhaps not quite realizing how accurate these words will turn out to be. The film is really about ethics, and the moral code by which these men of violence live (and die). Again and again, the characters talk about the importance of ethics (“I admire a man of principle,” says Tad the bartender played by Olek Krupa). Caspar’s vengeance demands Bernie’s head, and Tom advises Leo either give up Bernie or go to war. It is this situation that will ultimately divide Leo and Tom, or will it? Tom sets up a series of ‘plays,’ playing on his opponents’ view of ethics and moral responsibility. The theme of ethics permeates the entire film, but what about the use of hats in the film? By far, hats are the most distinctive symbol in the film. 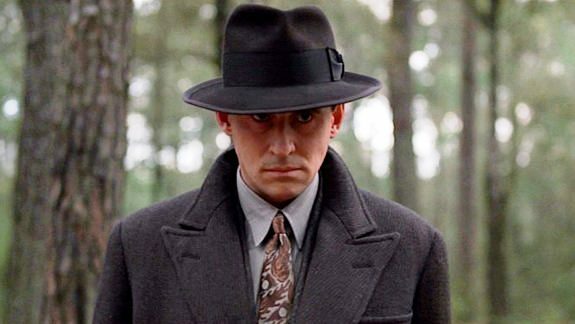 If Out of the Past, as the late, great Roger Ebert wrote in his brilliant analysis of that film, is the definitive movie about smoking, then Miller’s Crossing must be the definitive movie about hats. I have never seen a movie where hats are more important to the structure of the film. It’s not a prop, it’s not a running gag, it’s an essential ingredient to the unique flavor of this movie. The beautiful title sequence that’s shot in the haunting, fairy tale-like woods that will feature prominently in the second half of the film features a now-famous sequence of the hat floating in the wind. Over Carter Burwell’s playful yet somber, sweeping score, the hat dances around the trees. In this sequence, one could almost say that the hat is leading us through the woods and into the mysterious, dark beauty of the film. The title sequence, which is revealed to be a dream of Tom’s, leads us further down the rabbit hole, so to speak (“Deeper in the hole”, as Tom says). As he awakes, his first concern is his fedora (“where’s me hat?”), and it’s this concern that leads him back to Verna’s, where he left his hat. The hat is an active participant in the advancement of the plot. It’s significant that Verna takes Tom’s hat off as she kisses him, and later in the film, in a pivotal moment, Leo hands Tom his hat. 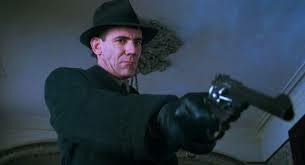 The hat in the gangster film has always been an important prop, but here, we realize that, to these gangsters, the hat is part of the persona. In this film, characters are constantly putting their hats on and off, and there seems to be an unusually high concern for the welfare of hats (“See you got your hat back.”) Tom’s hat seems to be part of his identity, and you could even say that the hat helps him play a role. The other character whose identity seems to be tied to their hat would be the sinister Dane. Where as Tom’s hat almost acts as a mask or a shield (maybe both? ), The Dane’s hat seems to accentuate his diabolical nature. They are the horns of this devil. The word “hat” itself is constantly mentioned in the movie. Johnny Caspar is especially fond of the word. He constantly bemoans to Leo that he is “sick of the high hat.” In a movie where the characters are repeatedly playing against each other and changing sides, the hats are an absolute. It’s more than a piece of wardrobe, the hat is ingrained into these characters’ DNA. 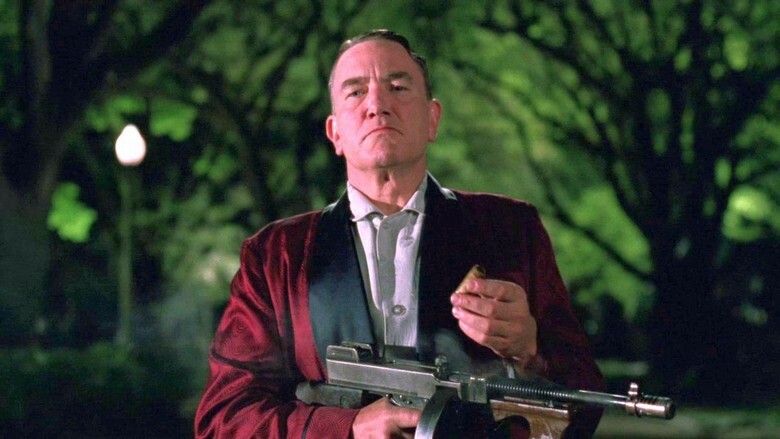 Miller’s Crossing. 1990. Dir. Joel and Ethan Coen. With Gabriel Byrne, Marcia Gay Harden, John Turturro, Jon Polito, J.E. Freeman, Steve Buscemi, Olek Krupa, Mike Starr, Michael Jeter and Albert Finney. Written by Joel and Ethan Coen. Cinematography by Barry Sonnenfeld. United States.